As hinted by one of its slogans, “Rio, Capital City of Biking”, the 2016 Olympics’ host has a very extensive bike network, the largest in Latin America. According to the city’s administration, there are 272.72 miles of rideable tracks for those that prefer a more sustainable, and perhaps less stressful, way of moving around. For tourists visiting Rio during the Games, it’s a great option for getting to some of the main Olympic venues, sightseeing or both. Rio’s bike network is divided among its four main regions: Downtown (3.68 mi), and the South (82.36 mi), North (37.61 mi) and West (149.07 mi) Zones. Previously, it was possible to go from the Recreio neighborhood, in the west, to Santos Dumont Airport, near downtown area, passing through most of the southern side of the city – provided you had the time and energy for it. However, after a bike lane suspended over the coast fell, killing two, in April, the connection between these areas is no longer available. 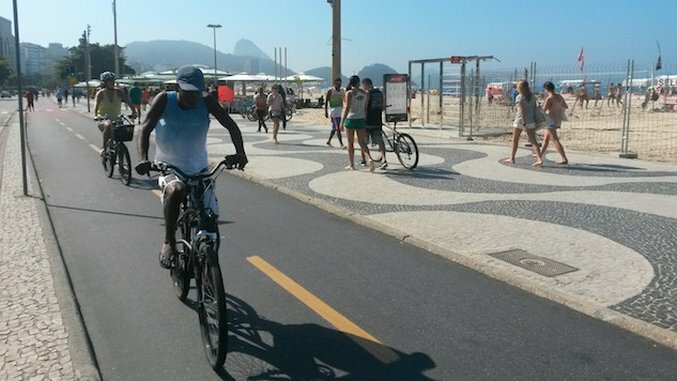 Considering that, the famous Copacabana beach – and the neighborhood of the same name – may be the best place to start an ‘Olympic’ bike ride, due to the neighborhood’s location at the center of one of the four official Olympic Zones. From there, you can easily get to Rodrigo de Freitas Lagoon – where the canoeing and rowing competitions will happen – by reaching Ipanema and using the shared sidewalks or following the lane until the Leblon area and taking the route that goes all the way to the lagoon. On the way, you’ll pass by Fort Copacabana, another venue, host to the Swimming Marathon, Road Cycling and Triathlon events. Going in the other direction, the lane goes right to the Beach Volleyball Arena, at the end of Copacabana. Here, bikers can make a stop at Leme (another seaside neighborhood) beach or turn left and continue the tour. Following along the track and through the Tunel Velho (old tunnel), is the Botafogo area. After a few minutes’ ride, comes a fork that takes to the placid Urca area, where the Sugarloaf Mountain and its cable car station are, or to the Botafogo Cove shore and the rest of the path. From this point on, the bike lane follows along the shore, providing a beautiful view of the Sugarloaf Mountain on the opposite side. A few minutes later is Flamengo Park (once considered an Olympic venue, though it got cut out of the final line-up), a landfill that became an artificial park and one of Rio’s postcards. Just after the park is the last Olympic venue reachable by the bike lane, the Gloria Marina, home to Olympic and Paralympic sailing competitions. Only a few miles ahead is the Museum of Modern Art (MAM, in Portuguese), followed by Santos Dumont Airport and, finally, the end of this stretch of the bike lane. Tourists who wish to visit the city’s historic center or the renewed port area can take a little detour at the MAM and use the ‘ciclofaixas’, corridors for bicycles in spaces otherwise used by motorized vehicles or passerby. There’s an automated bike rental system, named BikeRio, with stations spread across many areas of the city and through all of this tour, but be warned: the demand is huge during weekends and high season and malfunctions are a common problem when trying to release the bicycles.